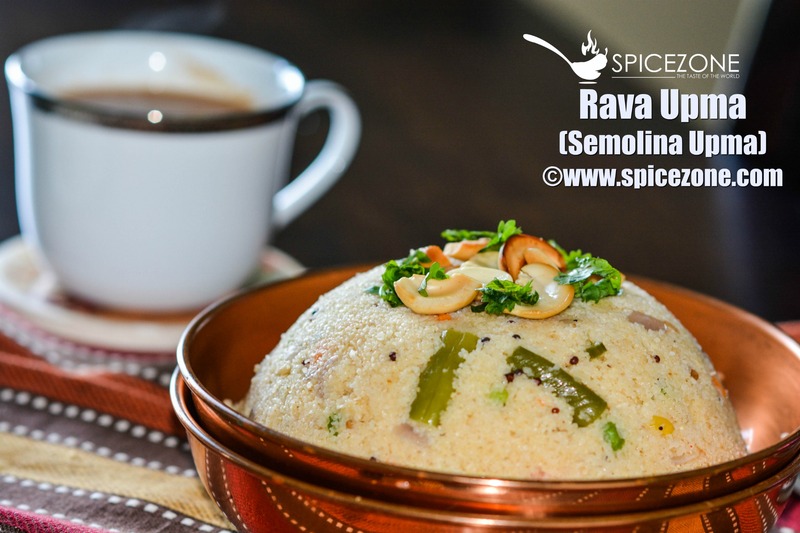 Rava Upma, a nutritious South Indian breakfast recipe which can be enjoyed at anytime of the day, not set in stone that it has to be for breakfast only. It is popular all over India and served at restaurants for breakfast. Sometimes I like these easy recipes for lunch too specially when I am making it just for myself. Such an easy recipe, full of nutrition with the goodness of veggies and can be ready in minutes. If you are not into vegetables then you can skip it altogether and the make the basic version which also tastes awesome. It is so hard to think of new things to make everyday for your kids. This literally took me 15 mins to put together as I had the roasted sooji and I used frozen veggies. What kind of breakfast or lunch recipes do you like? Are you also like me who loves to make things which are quick and healthy? Do give this recipe a try. So lets get to the actual recipe itself..
Roast the sooji and set aside. I used roasted sooji from the market, so I skipped the first step. Make sure its not brown in color, just slightly where it will still have the same color. In a kadhai or skillet, heat the oil. Add mustard seeds, urad dal, curry leaves, red chilli. Let it splutter and then add chopped onions and green chilies. Saute for a few mins until the onions are pink. Add the veggies and roast for a few minutes. Once they are cooked a little bit not all the way, add salt, red chili powder and water. Taste test the water for salt. If needed add it at this time. Let the water come to a boil and add sooji to it and mix it all together while adding the water. If you think it is still on the drier side, then you can add a little more water and cover it for 3-4 minutes. You can add the fried/roasted cashew at this time or you can garnish it when serving. 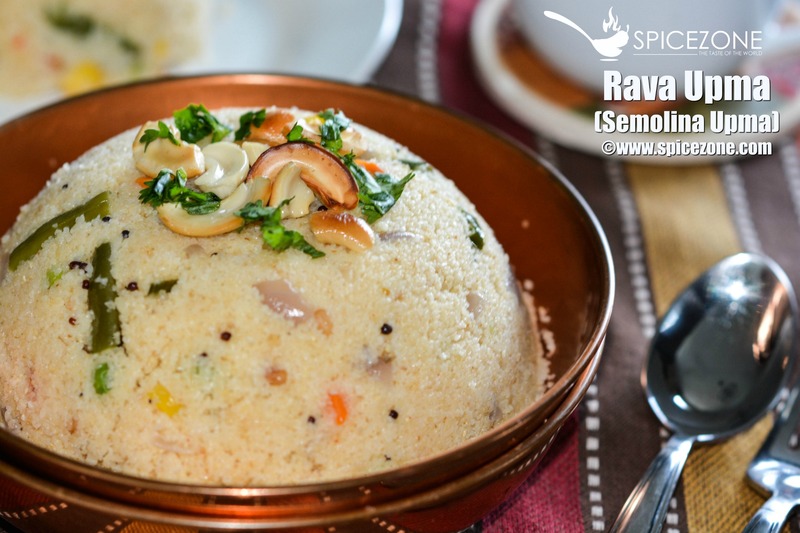 Your delicious Rava Upma is ready to be served. Serve it hot. Enjoy it with a cup of ginger tea. 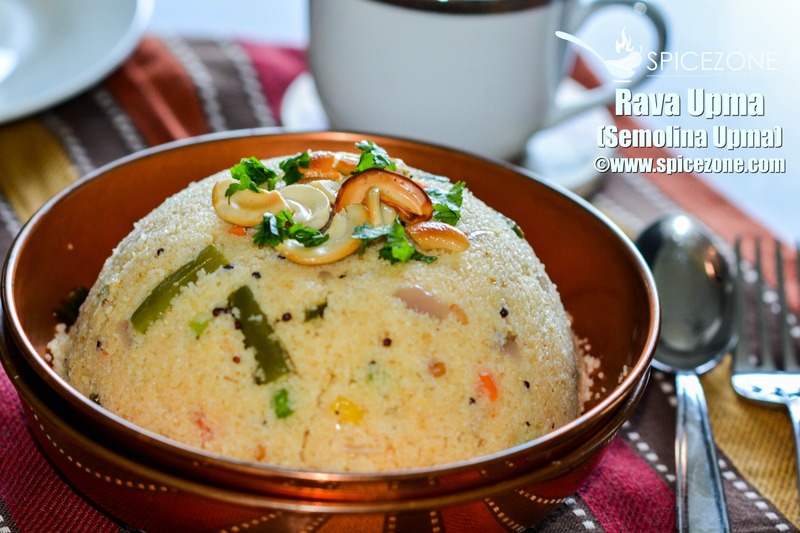 Enjoy this popular South Indian breakfast recipe of Rava Upma which is a quick and easy dish when you are short of time in the morning rushing out the door.